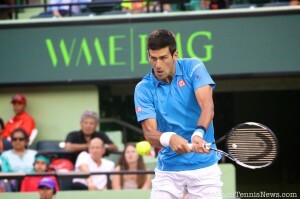 Round two of the Miami Open was an unmitigated disaster for the tournament. It all started when Roger Federer withdrew on Friday due to illness, after which Juan Martin Del Potro lost to lucky loser Horacio Zeballos. It continued on Saturday, when Rafael Nadal and Stan Wawrinka were ousted–albeit in much different fashions. On a searingly hot day in Miami, Nadal succumbed to the conditions and retired while trailing Damir Dzumhur 2-6, 6-4, 3-0. 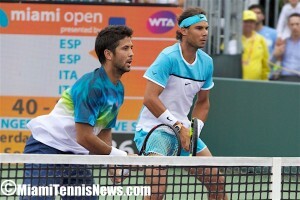 The fifth-ranked Spaniard rolled through the opening set but he clearly began to fade in the second. Sergiy Stakhovsky, Thomaz Bellucci, and Aljaz Bedene also retired. Sam Querrey might as well have done the same. Serving at 4-5 in the third set against Adrian Mannarino, Querrey completely shut down–perhaps both mentally and physically. The American received a warning, reportedly for not giving an effort, and then incurred a match-ending point penalty at 0-40. John Isner looked like he might retire against fellow American Tim Smyczek in their first set, as the world No. 13 struggled with both the heat and a left-knee issue. But he was saved, albeit temporarily, by cloud coverage and the setting sun. Isner battled back to force a third set but ultimately went down 6-2, 2-6, 7-6(5). He double-faulted twice in the final-set tiebreaker, including down match point. Isner’s last four losses have all come in third-set ‘breakers. In other action on the Grandstand, Andrey Kuznetsov upset an out-of-sorts Stan Wawrinka. The fourth-ranked Swiss served at just 54 percent, won only 65 percent of his first-serve points, and lost way more than half of his second-serve points (18 of 32). There was no rematch of the 2009 U.S. Open final on Friday at the Miami Open. The highly-anticipated showdown between Roger Federer and Juan Martin Del Potro did not come to fruition because Federer withdrew early in the afternoon due to illness. Gastroenteritis was the official reason for the former world No. 1’s absence. Federer took the practice court for a light warmup with coach Ivan Ljubicic around noon, hitting a few balls and working on some serves. He left after 30 minutes without signing any autographs. Speculation ran rampant that something was amiss with the Swiss, who had been set to make his first appearance since the Australian Open. A knee injury had sidelined Federer for all of February and from Indian Wells. Lucky loser Horacio Zeballos took Federer’s place, resulting in an all-Argentine affair with Del Potro. Despite suddenly staring at a much more favorable draw, Del Potro could not take advantage. Still experiencing pain in his left wrist, the 27-year-old lost 6-4, 6-4 in one hour and 21 minutes. Zeballos completely dominated on serve, surrendering only nine points in 10 service games. One break in each set was enough for the world No. 112, and the second came with Del Potro trying to stay in the match at 4-5 in the second. A shanked overhead by Del Potro brought up match point and he sent a forehand just past the baseline to end it. “I was suffering a little bit,” he admitted. “It was worse than my first match, but I hope nothing dangerous. I will see what’s going on after today and see if I can practice tomorrow–if I can hit again [a] backhand. What’s not good for the tournament is the early exits of Federer and Del Potro. The third-round matchup in that section of the draw is now Zeballos vs. Fernando Verdasco. Verdasco advanced with a 6-4, 6-4 defeat of Jeremy Chardy. Other winners on Friday were Novak Djokovic, Dominic Thiem, Steve Johnson, Benoit Paire, Marin Cilic, David Ferrer, Gilles Simon, and David Goffin. Tomas Berdych advanced via a walkover from Rajeev Ram. 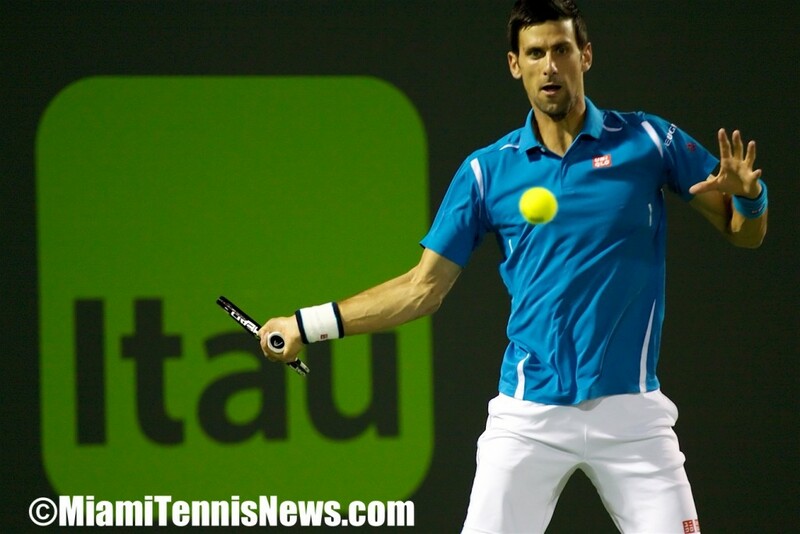 Djokovic kicked off the night session by defeating 21-year-old Brit Kyle Edmund 6-3, 6-3. 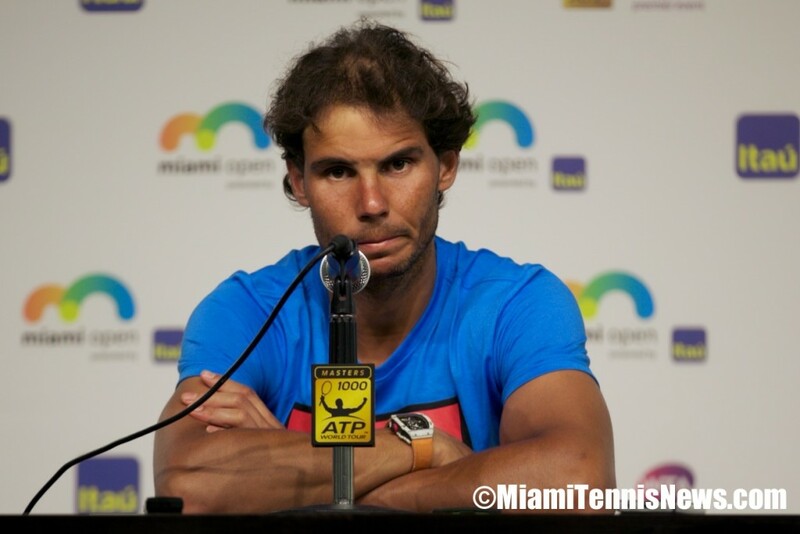 Rafael Nadal’s opening singles match at the Miami Open is scheduled for Saturday. Prior to meeting his second round opponent, Damir Dzumhur, the four time finalist sat down with the media to opine on a variety of topics including the state of his game in comparison to a year ago, the pluses and minuses of having one dominant player on tour in reference to Novak Djokovic and reaching soon the age of 30. Here is an excerpt of the what the world number five had to say. Despite being denied Miami’s grand prize several times, Nadal enjoys coming back season after season to compete. “I played well in my career here, Four finals; another semifinals; some more quarterfinals. So a positive tournament for me. the atmosphere here is great. I enjoy being here. The fans here are amazing with me”. With regards to his uncle and coach Toni expressing his concerns that tennis “will become a game of speed and power and not so much skill and tactics”. Nadal cited “the sport in general needs to improve in all aspects, and it’s obvious that the players today are taller than before. The racquet hits the ball harder than four years before. [At] the same time, it is true that nothing changed in our sport in terms of rules. So for the moment, it is obvious that the tennis has had tremendous successful for I think a long time now. The sport is healthy, but at the same time we need to move to predict the future. I’m not talking for my generation, but for the next generation. People, in my opinion, like the drama, the rallies. I don’t remember amazing matches that were only one serve and one shot. The matches that the people remember most, are slow matches with unbelievable points, and the applause of the people or the emotions of the people are not only with one serve and one shot. People get emotional when the points are intense, long. If every time we make that happen less often, it’s obvious that our sport can be in trouble for the future”. In order to get a shot at hoisting his maiden Miami Open trophy, Nadal may need to go through Stan Wawrinka in the quarterfinals and Andy Murray in the semifinals. 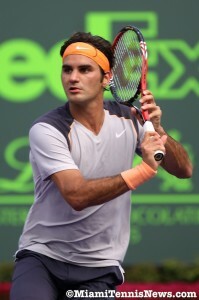 It will be Roger Federer vs. Juan Martin Del Potro in round two of the Miami Open on Friday afternoon. 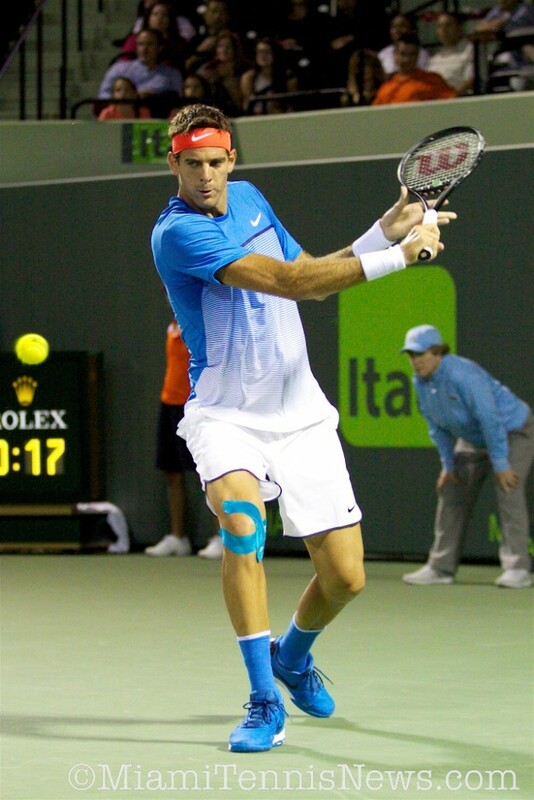 Del Potro assured that the highly-anticipated showdown would become a reality when he got the best of fellow Argentine Guido Pella 6-0, 7-6(3) on the opening day of main-draw action on Wednesday night. The former world No. 4 held all nine of his service games to advance after one hour and 29 minutes. Contesting his third tournament of 2016, Del Potro got off to an emphatic start at the expense of his countryman. Pella had been in outstanding form following a February swing that included a runner-up finish in Rio de Janeiro, but he had no answer for Del Potro in the first set. The world No. 39 won just 14 points in the opener and failed to convert any of his two break opportunities. Pella managed to make the second set competitive even though he became even more hopeless against his opponent’s serve. Del Potro surrendered only seven points in his last six service games but was pushed to a tiebreaker soon after missing a match point with Pella serving at 4-5. Pella got a mini-break back late in the ‘breaker with a net-cord winner, but Del Potro won two consecutive return points at 5-4 and 6-4 to seal the deal. 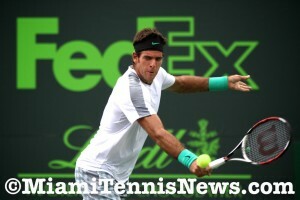 “I made it through and I’m so, so happy for the chance to play against Roger after tomorrow,” Del Potro told the crowd. Due to the world No. 366’s recent inactivity related to multiple left-wrist surgeries, Federer and Del Potro have not squared off since the 2013 World Tour Finals. Before Del Potro started succumbing to physical problems, this rivalry was shaping up to be one of the sport’s best even though Federer has a comfortable 15-5 lead in the head-to-head series. The two veterans have engaged in several memorable meetings, including in the 2009 U.S. Open final (won by Del Potro) and in the semis of the 2012 London Olympics (won by Federer). Joining Del Potro in the Miami second round on Wednesday were 18-year-olds Alexander Zverev and Taylor Fritz, just to name a few. To at least a small degree, Zverev erased the demons of his brutal fourth-round loss in Indian Wells to Rafael Nadal by holding off Michael Mmoh 7-6(3), 7-6(4). Also in the midst of a breakout 2016 campaign, Fritz took care of Simone Bolelli 6-4, 6-2. Marty Fish, the 2009 Delray Beach Open champion, will make his debut on the ATP Champions Tour when the tournament kicks off on February 12, 2016. Fish will be joined by former ATP Tour players that will include James Blake, Mark Philippoussis, Sebastien Grosjean, Greg Rusedski and Aaron Krickstein. The ATP Champions tour is held the first weekend of the Delray Beach Open which serves as the ATP World Tour’s first North American hard court event. DELRAY BEACH: Former world No. 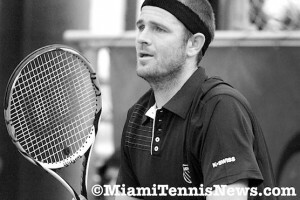 7 Mardy Fish will make his ATP Champions Tour debut at the 2016 Delray Beach Open, returning to the event where he continues to be the only ATP World Tour champion in tournament history to win as the top-seed – a feat he accomplished in 2009. Additionally, former Davis Cup teammate and world No. 4 James Blake will join Fish in the ATP Champions Tour field that was announced today by the tournament. Four of the six players who will play in the event have ties to the area, including Fish, a former Vero Beach resident. The three-day, six-player round-robin tournament is played the first weekend of the 10-day Delray Beach Open and includes an American team competing against an International trio. The action begins Friday, Feb. 12 with a pair of night matches, followed by four matches over Saturday day and night, and three Sunday afternoon matches that could decide the team title. Joining Blake and Fish on Team USA is current Boca resident Aaron Krickstein while Team International includes former Delray Beach resident Mark Philippoussis (AUS), longtime Boca Raton resident Sebastien Grosjean (FRA), and Greg Rusedski (GBR). The tournament is also announcing its annual Holiday Promotion, which discounts individual box and reserved tickets for all ATP Champions Tour matches (Sessions 1-4, 50% off) and ATP World Tour matches (Sessions 5-17, 20% off). The promotion begins Nov. 26 and runs through Dec. 31. Fish, who last played in Delray Beach in 2011, missed most of the 2012, 2013 and 2014 ATP World Tour seasons as he battled a heart ailment and anxiety issues that he has since openly discussed in efforts to help others who battle the disorder. He played in several ATP World Tour events in 2015 before announcing his retirement prior to the US Open, where his career ended in a stirring five-set defeat in the second round. Over his career, Fish won six ATP titles and reached the quarterfinals of three Grand Slam tournaments. Fish went 19-7 in eight Delray Beach appearances, and in addition to his ’09 title, reached the final in 2003 and semifinals in 2009 and 2001. Blake, a two-time ATP World Tour Delray Beach finalist (2007 & 2008), made his debut on the ATP Champions Tour in Delray Beach a year ago. Like Fish, he reached three Grand Slam quarterfinals during his ATP World Tour career and was runner-up to Roger Federer in the season-ending 2006 ATP World Tour Championships. Two-time Grand Slam runner-up Philippoussis will be playing in his third ATP Champions Tour event in Delray Beach – he won the 2011 title when the tournament crowned an individual champion. A 1997 US Open finalist, Rusedski was 6-2 in Delray Beach as an ATP pro and reached the event’s 1995 final while four-time Grand Slam semifinalist Grosjean was 5-3 in Delray Beach and played in a 1999 semifinal. Rusedski and Grosjean are making their first Delray Beach ATP Champions Tour appearances. The Delray Beach Open also announced a new ‘no-ad’ format for all ATP Champions Tour matches – at deuce, the player returning serve picks the side he wants to return from; the winner of that point wins the game. A traditional 7-point tiebreaker will continue to be played at six games apiece and a match tiebreak (10-point) will continue to decide a match when players split the first two sets. Sunday’s 12:30 pm match on Court 1 will be of local interest because it creates a “country club rivalry” between Krickstein and Grosjean, who never played each other on the ATP World Tour. Krickstein is the longtime head pro at St. Andrews Country Club in Boca Raton while Grosjean is a resident of Woodfield Country Club, also in Boca. Grosjean currently coaches Top 10 Richard Gasquet. In addition to their ATP Champions Tour play, Blake and Philippoussis have been given a wild card to partner in doubles in the ATP World Tour event. Discounted ticket are available at http://www.yellowtennisball.com/tickets/ with prices starting at $14.50. Fans can also visit the on-site box office at 30 NW 1st Avenue in Delray Beach, or call 561-330-6000. Former ATP World Tour No. 8 Grigor Dimitrov has been added to the Delray Beach Open that will be played February 12 – 21, 2016. Dimitrov joins fellow ATP players Milos Raonic and Tommy Haas as the ATP kicks off the first North American hard court event of 2016. Below is the official tournament press release. DELRAY BEACH: ATP World Tour star Grigor Dimitrov has joined the 32-player field for the 2016 Delray Beach Open, while 2006 champion Tommy Haas has added Delray Beach to his 2016 return tour. The tournament previously announced that world No. 9 Milos Raonic of Canada and the longtime world top-ranked American doubles duo, the Bryan Brothers, have committed to play in Delray Beach’s ATP World tour event next February. In its 18th year in the city and 24th overall, the Delray Beach Open will be played February 12-21, 2016 at the Delray Beach Stadium & Tennis Center. Dimitrov, 24, reached a No. 8 world ranking in 2014 thanks to a pair of semifinal finishes in Rome and Toronto, and a win over world No. 4 Andy Murray that propelled him to the Wimbledon semifinal. The Bulgarian, who famously dated Maria Sharapova for two years, has already won four ATP titles and has 10 career wins over Top 10 players. The 37-year-old Haas has returned to the Top 20 from major surgery three times in his career, and is embarking on a fourth run after shoulder surgery last year. Twice Haas has been named the ATP’s “Comeback Player of the Year” and his 15 ATP World Tour titles and more than 550 career wins have him surpassing the $13 million earnings mark for his 20-year career. Haas reached a career-high No. 2 ranking in 2002 shortly after reaching the Australian Open semifinal, and he won the Delray Beach tournament in his first appearance in 2006. He owns an 11-7 record in eight Delray appearances. The Delray Beach Open also announced that its ATP World Tour qualifying event will consist of a 16-player field instead of the 32-player draw that has been customary since the event’s inception. All ATP 250-level tournaments are making the adjustment. The 10-day Delray Beach Open also includes an ATP Champions Tour event, which brings legends of the game into town to play during the opening weekend. 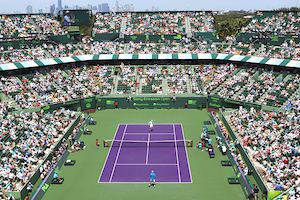 A number of tournament seating packages are on sale, including the Reserved Diamond Series that includes tickets to all 17 sessions of the ATP Champions Tour and ATP World Tour events (Friday, Feb. 12 – Sunday, Feb. 21, 2016) for $500. Reserved seats (sections A – O) are located just behind the box seats and have back support and arm rests. The popular Weekender Series that includes a reserved seat for the quarterfinals, semifinals and finals (sessions 13-17) is $200. Other 17-session ticket packages include the courtside box series packages ($1,500 for two seats or $2,500 for four), the on-court Best Seats in the House package priced at $3,000 for two seats, or $4,500 for four and the covered Veranda seats. The Veranda seats are also available for individual sessions. The event’s new Sky Suites and Sky Boxes start at $7,000 for all 17 sessions. They accommodate 8 to 24 people and include food and beverage options. Fans can order tickets online at http://www.yellowtennisball.com/tickets/, visit the on-site box office at 30 NW 1st Avenue in Delray Beach, or call 561-330-6000.